Carnitine is a biochemical found in nearly every cell in the human body. There are several forms of carnitine (e.g., L-Carnitine, Acetyl L-carnitine), which have been studied for their effects on the heart and brain, the aging process, energy metabolism in the cells, diabetes, infertility and other medical conditions. Our focus is on the role L-Carnitine plays in energy production and metabolism for healthy individuals. The “power” generator of the cells in your body is the mitochondria. Carnitine has a critical role in the mitochondria’s ability to produce energy. It acts like a key that unlocks the door so long-chain fatty acids can pass into the cell and be “burned” for energy. Carnitine also removes waste products out of the cells to prevent their accumulation. It is highly concentrated in skeletal muscle tissue and the heart, both of which utilize fatty acids as fuel. For these reasons, L-Carnitine has received a lot of research attention as a supplement to help improve athletic/fitness performance, oxygen use during exercise, recovery time and also for weight loss. In theory, a carnitine supplement should boost physical performance by enhancing the body’s ability to use oxygen or boost metabolism during exercise. However, 20 years of studies on athletic performance have not produced consistent evidence to support L-carnitine supplements can enhance athletic performance, improve body composition, or facilitate significant weight loss. Exercise scientists also have examined the effect of L-Carnitine on recovery and muscle repair after intense sport conditioning in healthy adults (including vegans, vegetarians) and youth athletes. Overall, studies indicate 1-4 g/day of L-Carnitine enhances recovery, particularly muscle repair, from intense weight-training, sport conditioning, and endurance exercise in healthy individuals. Because of the wide variety of studies, it’s important to talk with your health practitioner to see if L-Carnitine may be a beneficial supplement for you. The body produces sufficient carnitine for the needs of most healthy people. If your diet includes lean cuts of meat, fish, poultry, and milk, you are getting adequate Carnitine. Vegans may want to check with their health practitioner if they are concerned that their diet is not providing sufficient carnitine. 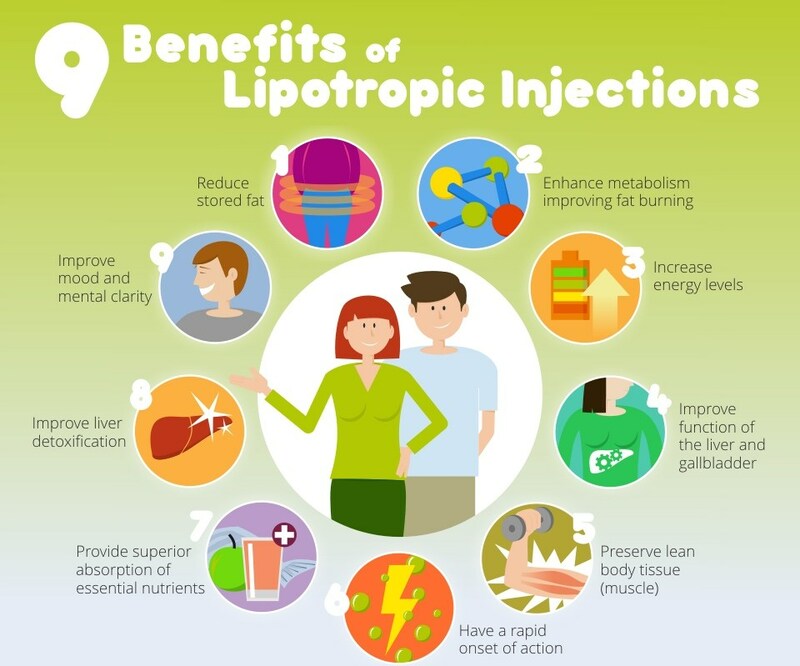 Lipotrophic Injections are made up of natural ingredients which help enhance liver and gallbladder’s role by decreasing fat deposits throughout the body and speed up the metabolism of fat and its removal. The main amino acids used to formulate these shots are Methionine, Inositol, Choline, L-Carnitine and B12.